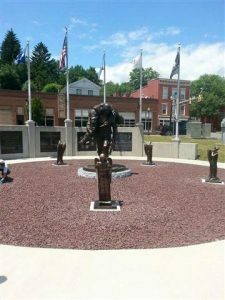 The Quintessential Soldiers (above) will be seen in a new light when a steel rotunda with recessed lighting is constructed at the Bradford County Veterans Memorial Park in Towanda. Fundraising is currently underway to complete the project. 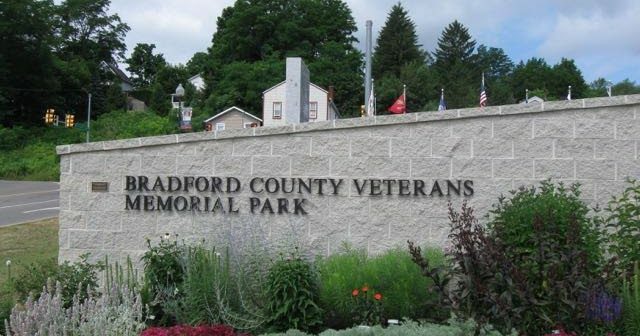 After a short break from the Bradford County Veterans Memorial Park Association (BCVMPA), Joe Doherty has returned to help put the finishing touches on the park in Towanda at the west end of the Veterans Memorial Bridge over the Susquehanna River. Doherty had worked with numerous individuals and entities over the course of seven years to bring the park to its current state. When it seemed that funding had run out and interest in the project had waned, Doherty declared the project finished, stepped away from the committee and took a well-deserved vacation with his wife, Sandy, who had also worked on the project. Upon his return from California, Doherty related, “They’d decided that they want to build the rotunda and asked me to come back and raise some funds.” Reinvigorated by his trip and never one to give up, Doherty accepted the challenge. His current assessment of the park between South Main Street and the Merrill Parkway reveals that the four-foot angels holding scrolls that are currently in place (above) are temporary. They were cast in epoxy to give the park a a finished appearance for what Doherty said at that time was a final ceremony. 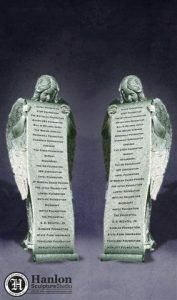 In fact, the planned five-foot granite version of the angels (below) have been completed and are currently in storage. The pedestals on which the angels are currently situated were meant to hold a beautiful steel rotunda, the crowning jewel for the project that was seemingly scrapped from the plans, much to the dismay of many, including Doherty. “I was upset,” he said of their deletion from the final plans. In his absence, enough BCVMPA members and their supporters, including group co-leader Tim Hoffman, reconsidered their options and felt that they could get enough people behind them to bring more of the original plans to fruition. The BCVMPA will conduct an awards ceremony and fundraiser dinner at the Towanda Country Club on Sunday, June 4, starting at 4 pm. The event will feature hors d’oeurvres, refreshments, a dinner of either prime rib or baked haddock, free champagne and a cash bar. 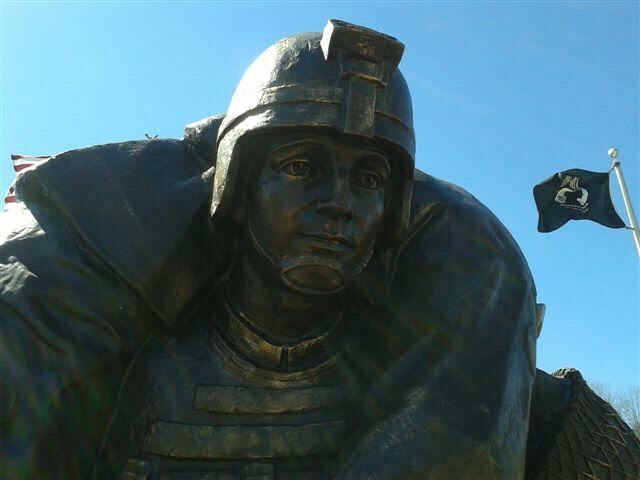 Background music will be provided, and guest speakers will present key supporters with statuettes of the Quintessential Soldiers and highlight the value of completing the park during the semi-formal affair. The cost is $60 per person, and all proceeds go toward the $40,000 needed to erect the rotunda and place the new angels on new pedestals. The finished park will also be a beacon to night-time travelers. 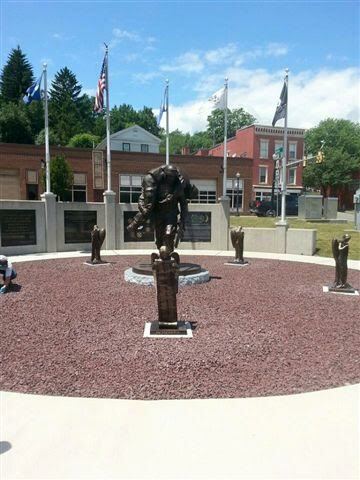 “We want to put recessed lighting in the circle at the top so that it shines directly down on the soldier statue,” said Doherty, who noted that the temporary angels will be donated to Towanda America Legion Post 42. 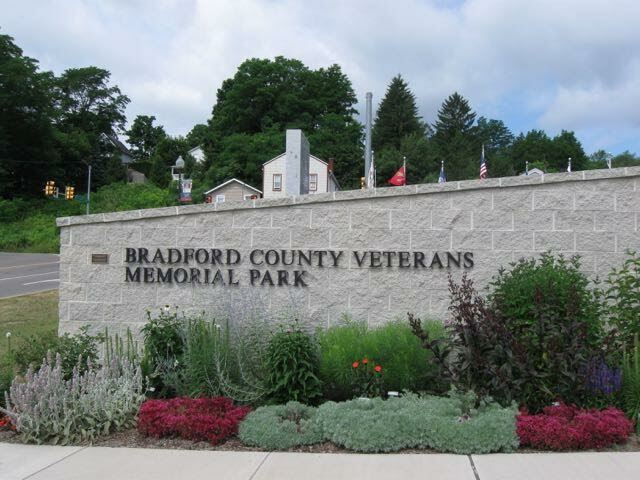 Upon completion of the rotunda, the BCVMPA will work with the Towanda Master Gardeners who provided the plantings in front of the entrance wall at the parking area to have numerous trees and shrubs planted to compliment the artistic elements of the park. Supporters are asked to RSVP by May 26 for the fundraiser dinner with payment, contact information and dinner choices to BCVMPA, PO Box 206, Towanda, PA, 18848.